Restore and maintain the Grade II* listed Old Rectory. Develop the building as an historic Georgian house and open it to the public. Develop exhibitions and activities based on the lives of the ‘middling’ people of Carshalton during the Georgian and Victorian periods: the lower gentry; the professionals including the clergy; established tradesmen such as builders and shop keepers; the people who mainly organised and physically made the Georgian and Victorian worlds. Involve the general public from the beginning of the project, with as many people as possible participating in the restoration. Volunteers will be used during each phase of the development of the house. The Old Rectory is ideally suited to the purpose as it is of the right status and was either occupied by the rector, who was a central figure in the local community, or was let out to others of similar standing. Our target audience was adults, children, families and schools from the local area, south-west London and north-east Surrey. 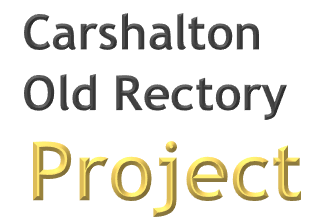 We will work with the other groups within the Carshalton Conservation Area to create a series of educational experiences and community activities to draw in people from a wider area. The project was to have been funded by creating three flats, two in the attic and one on the first floor. The work will be phased so that these can pay for the conversion and restoration costs and then for the ongoing maintenance of the building, the exhibitions and activities. To protect the building by developing sufficient cash inflows to carry out all essential maintenance work required for a building of this size and age. To develop a business model that is self-sustaining. To develop and fund exhibitions and community based activities. 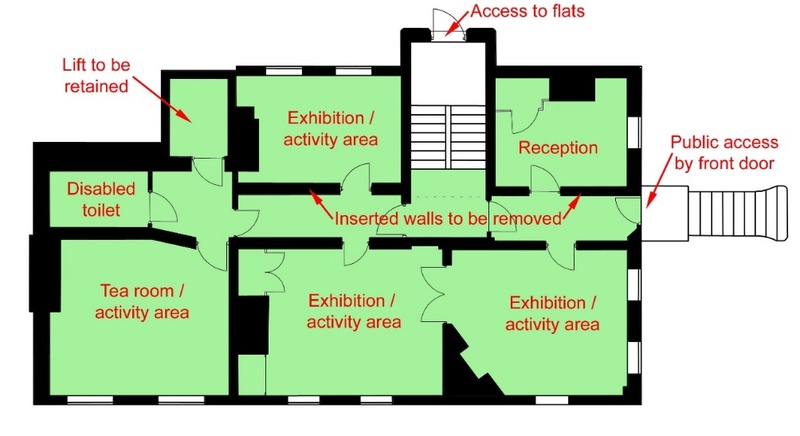 Exhibition space: The exhibition and activity area occupying the ground floor, one room on the first floor and one room in the basement. Administrative Space: A room on the first floor to be used as an office, store and an exhibition and activity preparation area. 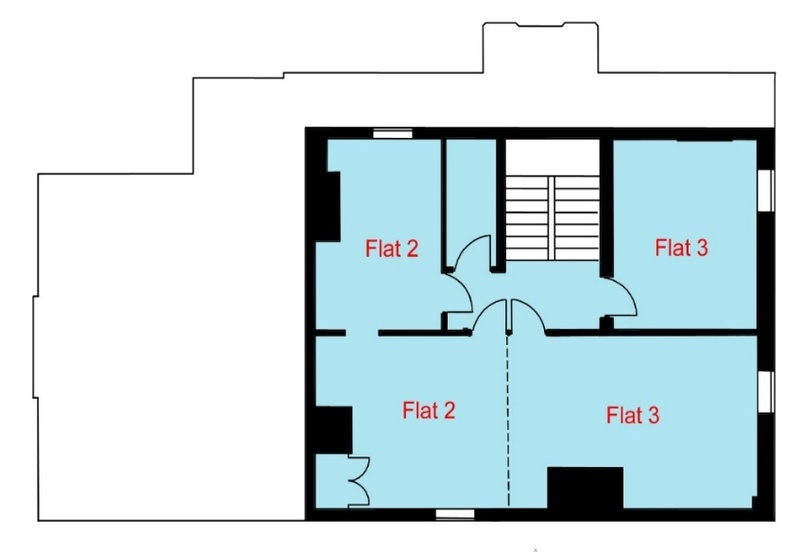 Private Accommodation: Three flats to be rented out at market rates to generate the income needed to support the project. 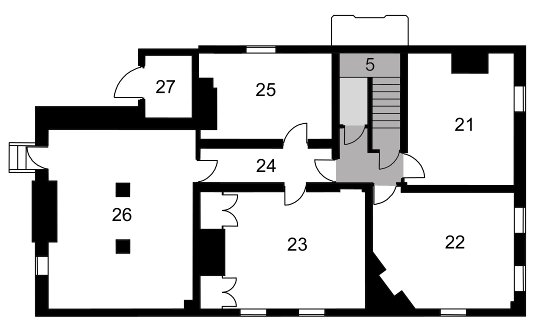 Plans showing the division of the house - the public areas are shaded green. 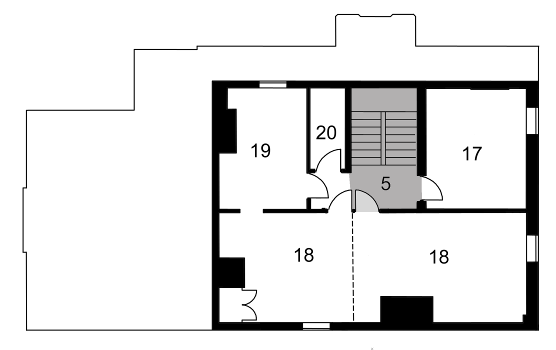 Proposed use of the rooms on the ground floor. 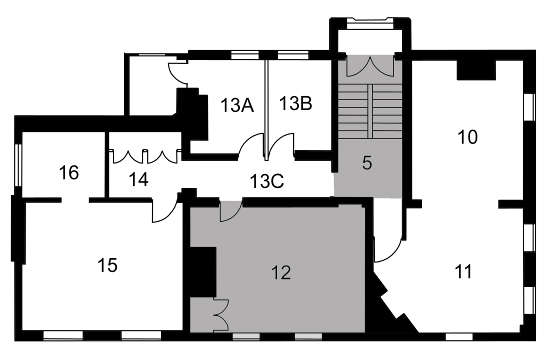 Proposed use of the rooms in the basement. 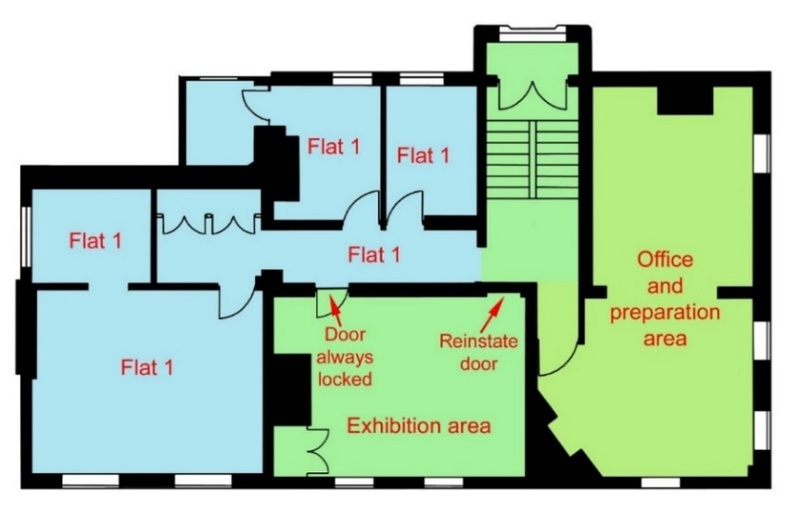 Proposed use of the rooms in the attic. The lives of the people who lived in the house and the people who worked for them. Other ‘middling’ people in Carshalton including successful tradesmen, inn keepers, professionals and the lesser gentry. The changing economic world that these people inhabited including connections to the slave trade as well as links to Europe, Africa, the Americas and Asia. There was also to be some temporary exhibition space available for displaying the work of local art groups and artists. Redecoration and other practical work not needing professional qualifications. Research into the building and decorating practices of the period and the day to day work involved in running a Georgian house. Enabling volunteers to undertake historical research into the lives of the people associated with the house and the village. All this information will feed into the exhibition. Once the exhibition space is established we will offer a range of activities and events aimed at adults, children, family groups and school groups. These will be based on the themes developed in the exhibition. A crucial feature of the new schools Curriculum is that children need to be more aware of local history. They have to conduct a local history study which focuses on significant events, people and places in their own local area. The lives of the people who lived in the house and those who worked for them and provided services for them in the village. Children’s education, childhood pastimes and child labour. Important local figures such as Lord Nelson and the time he lived at Merton Place, further down the River Wandle from Carshalton. The connection between significant local people and the financial crisis of 1720 (the South Sea Bubble). Local connections to the slave trade. The Old Rectory is a beautiful historic house in the heart of Carshalton village. The preservation of this area, largely by the proactive Council, has enabled the village to retain a character that many other parts of London have sadly lost. The house is a Grade II* listed building within the Carshalton Conservation Area. It was built in the early 18th century in the Queen Anne style and has an attractive exterior and a well preserved interior with much of the original panelling. It is one of the finest historic buildings in the Borough and has long been a local landmark. There have been two recent appraisals – One by CORA and one by Pre-Construct Archaeology (commissioned by the Council). 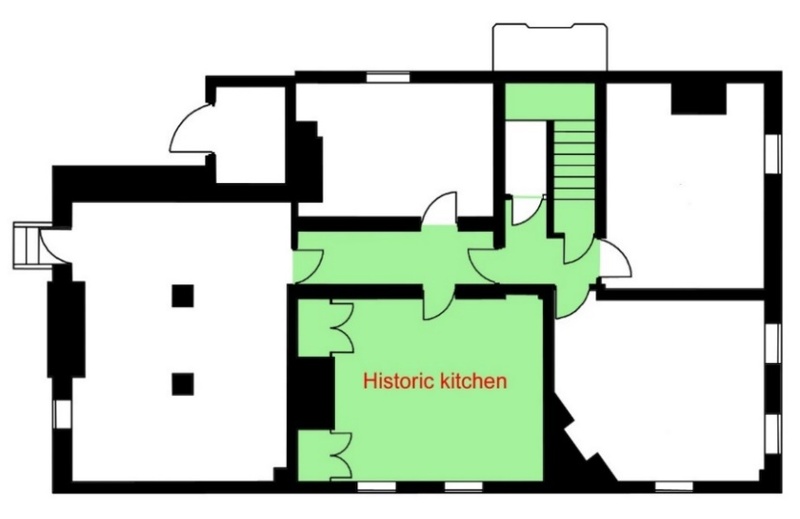 Both surveys came to broadly the same conclusions: that the house as a whole is of considerable significance and that the best preserved areas are the ground floor, the stair case and part of the first floor. The plans below, drawn from our own survey, show the most important areas. 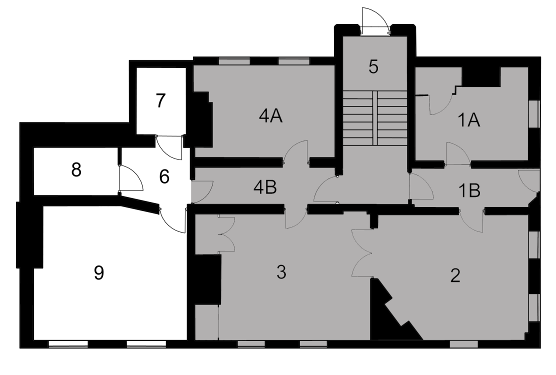 The best-preserved rooms are shaded grey. 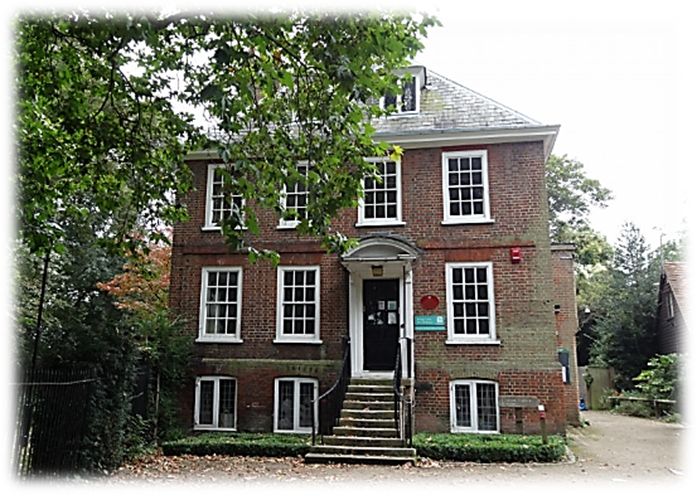 The Old Rectory sits within the Carshalton Village Conservation Area and is one of the cluster of historic and listed buildings around Carshalton ponds. The special character of the area has been recognized for well over a century and was the reason why the Carshalton Urban District Council acquired most of the land and buildings around the ponds in the 1920s, 1930s and 1940s. The Conservation Area was designated in 1968, being the first area to be given CA status by the London Borough of Sutton. It contains many of the Borough’s listed and locally listed buildings - which contribute to the historical significance of the area as well as ensuring that the Carshalton village is one of the most distinctive landscapes of suburban south London. The Ponds and Grove Park: The two Carshalton Ponds – Upper and Lower – have long been a feature of Carshalton. The Lower Pond was part of The Grove estate which was acquired by Carshalton Council in 1923 to provide a public park. The springs and ponds feed into the River Wandle. The Grove Project: The Grove is a 19th century house which stands in Grove Park at the eastern end of the Ponds. It was used as Council Offices but is now surplus to requirements. Sutton Centre for the Voluntary Sector intends to develop the building for community and office use. All Saints Church: The church dates from before the Norman Conquest and has been altered and added to over the years. The beautiful interior decoration, for which the church is renown, was begun in 1919 when Sir Ninian Comper undertook the embellishment of the interior - the high altar triptych, the Lady altar reredos, the rood and the screen, and the exquisite organ tribune. Honeywood Museum: This stands at the western end of the Upper Pond very close to the Old Rectory. It was opened by the Council in 1990 to display its existing museum collection and provide an educational facility. The museum’s exhibits cover the whole of the London Borough of Sutton. The Ecology Centre: This occupies an area of open ground on the north side of the Pond which was formerly the garden of a house called the Lodge. In the late 1980s the Council laid it out as a varied environmental habitat and nature reserve with facilities for educational visits and other activities. EcoLocal and the Lodge project: The Lodge is a large house close to the Old Rectory. It was acquired by the Council in the 1940s and was used for offices. The Council has agreed to hand the building over to the environmental charity EcoLocal to turn part of the building into housing and part for community activities. The Carshalton House Water Tower and historic garden: Carshalton House was built about 1700 for Edward Carleton who was a London merchant. In the early 18th century it was owned by Sir John Fellowes, the sub-governor of the notorious South Sea Company. He built a very fine water tower in the grounds which is now maintained and opened by the Water Tower Trust along with a listed mid-18th century garden. The house is now a school. Underway is the creation of a new regional park for London that connects communities across four boroughs. The park encompasses a chain of open spaces along and around the Wandle in the London Boroughs of Croydon, Sutton, Merton and Wandsworth. A large new open space, which will be created on a former gravel extraction and landfill site between Beddington Park and Mitcham Common, will also be added to the park in due course. The Borough of Sutton has four village centres around the edge of the park – Beddington, Carshalton, Hackbridge and Wallington. 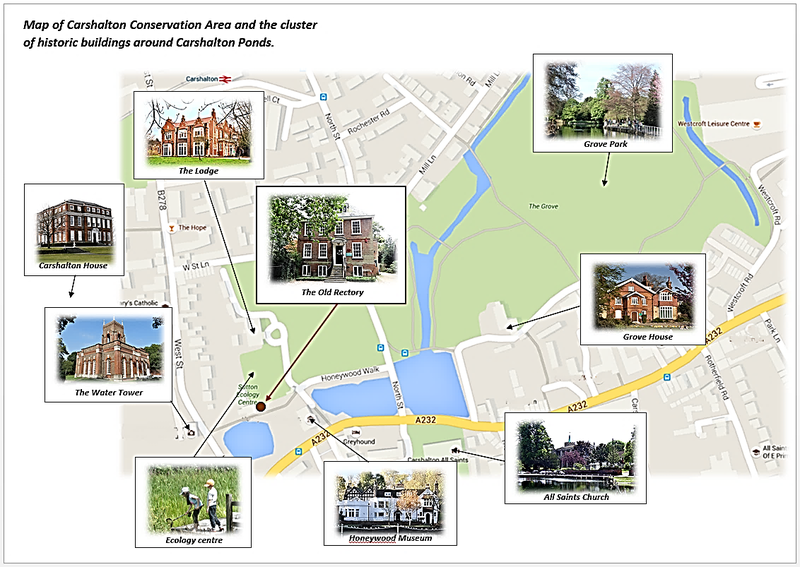 Of these four it is Carshalton that stands out with ponds, historic buildings and parks. The Wandle Valley Regional Park’s considerable area will be of regional rather than just local significance, comparable to the Lee Valley Regional Park in size and importance. As such, it should bring significant economic benefits to the borough and historic Carshalton is central to the realisation of these.